Hi, it’s time for Tuesday Stretch with BugDoc Dave. I think that most of you got a proxy taste of last week’s Stretch Glass Society Convention and Show that emphasized green iridized glass. I’m going to continue with the theme tonight to show you some of my images of some truly outstanding stretch glass that was displayed. If you haven’t figured it out yet, I really like the strange and unusual, especially strange forms and different colors. In our club display, it was really easy to see the subtle differences that occur among the various manufacturers of green stretch. Most of the attendees were treated to the opportunity to see the blue-green tint that most of the Diamond and Central green stretch glass displays when compared to the true Florentine Green of Fenton. As Russell Umbraco pointed out, green is one of those colors that many see differently, especially men who often have trouble seeing in the green spectrum. My first two pieces are some olive-green to light emerald green pieces made by Jeannette. 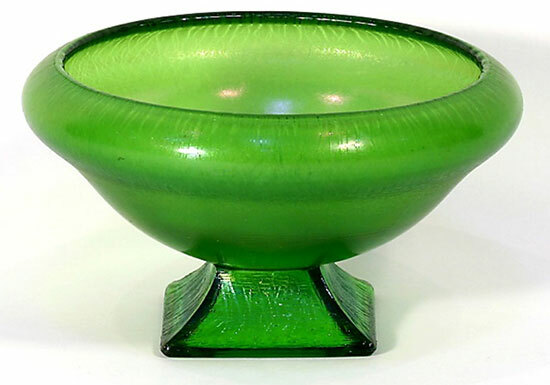 There are only two of the footed bowls known in this color (different top shapes) and two to three of the high-footed comports. To many, these may reach that “rare, but who cares” category. I really like them because of their unique colors and designs. As I pointed out, Diamond’s green generally has a bit more blue in it and I’m hoping that this feature comes through in the following images of Diamond’s spindle-shaped candleholders and a similar sized set of Fenton’s #232 candleholders. Unfortunately, when you are at a mall, flea market or even an auction, this difference is difficult to use to help identify common bowls unless you have a Diamond bowl next to a Fenton bowl! U.S. also made a transparent olive-green glass and most of these items come in the #314 line. This line has four paired optic rays (the #310 rays are on the exterior of the pieces) and the top rims are straight (without points). I’m using a footed bowl to illustrate this color. This olive-green comes in two shades, a light (most common) and darker (less common) version. 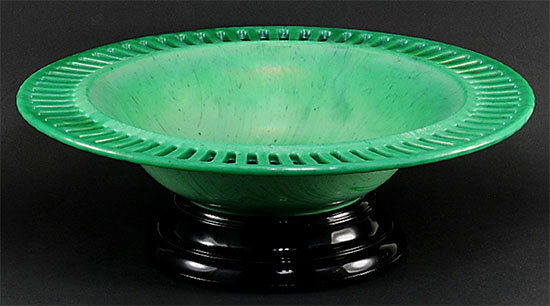 The next U.S. green is a version of translucent to completely opaque Jade Green color. This is one of my favorites as the color can range from a deep brownish green to a very light, grassy green color. 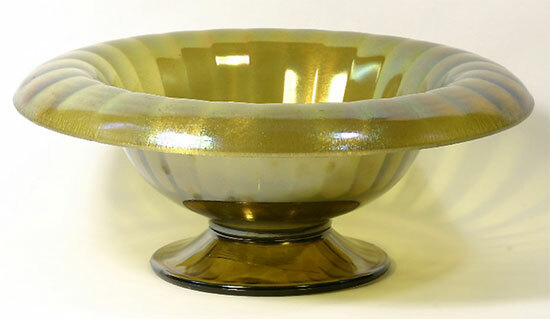 Most of the bowls made in this color have optic rays and points which appears to be a separate, but unidentified, line number. This color is also quite common in some blown-molded vases that come in about four different base sizes and a multitude of shapes. Finally, the most desired by advanced stretch glass collectors is the Carrara line which consists of several opaque, slag-glass colors. In this line there is a green slag glass type that we are still trying to attach a name to. It is often referred to as Forest Green or Nile Green, depending on the researcher or book author. 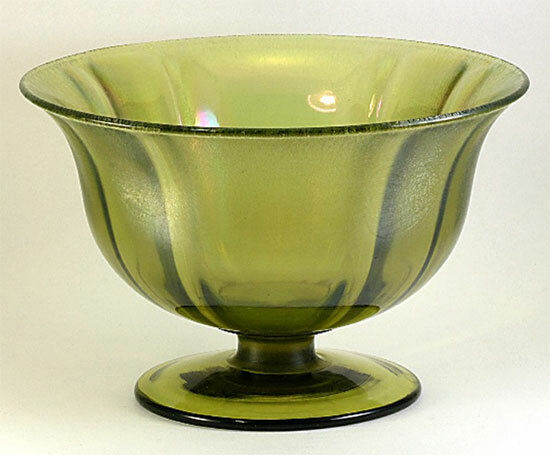 Nile Green is a common color name used by several companies in the 1920s and 1930s to refer to dark green glass. And, my final favorite is the emerald green of Northwood. 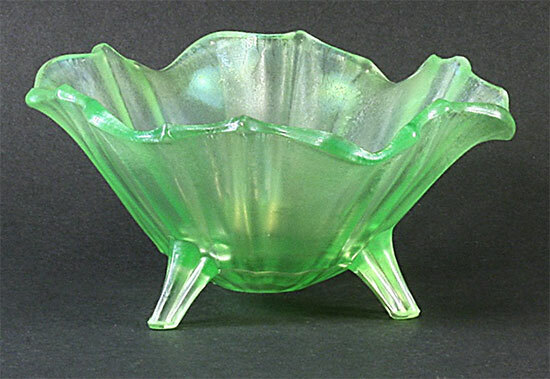 Apparently, when Northwood was moving into making iridescent stretch glass, they produced a relatively small number of emerald green pieces, but abandoned the color in favor of their Blue, Topaz, Russet and Jade Blue colors. Bummer! Speaking of Russet, that was the “other” green glass that was in our display. It is a unique brownish-green color and when we got a lot of it assembled, you could definitely see a range of colors from light to dark.